is made from only the freshest, all natural ingredients. 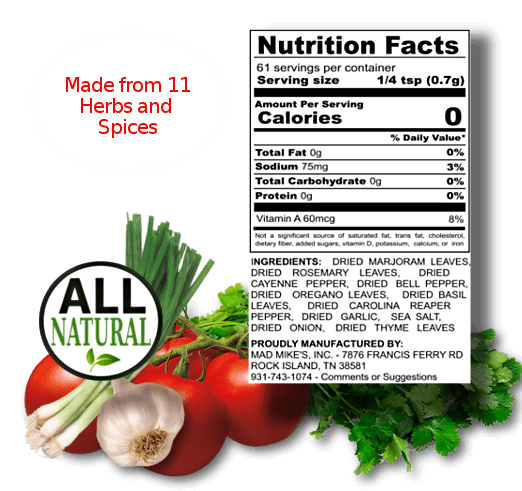 From the organically grown Carolina Reaper peppers, to the fresh grown garlic, onions and cilantro. Every batch is handmade in our FDA registered and Tennessee Department of Agriculture inspected manufacturing facility; to ensure Mad Mike's Reapercussion® Salsa is created with the highest standards. We strive to use the freshest, locally grown ingredients available, and avoid any products that contain BPA or chemicals. Also, you will never find any vinegar in our ingredient list. Handmade in Rock Island, Tennessee with the freshest ingredients!